The Arizona Cardinals announced on Monday that starting left tackle Jared Veldheer would be placed on season-ending injured reserve. The move comes after Veldheer suffered a fractured ankle in his team’s 12-7 win over the Tennessee Titans in Week 14. 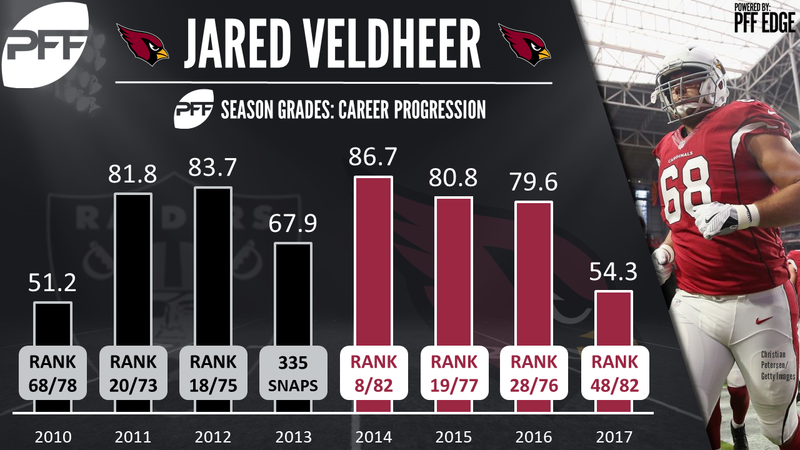 Veldheer had been the Cardinals starting right tackle for the first nine games of the season before switching to the left side to replace the injured D.J. Humphries after Week 10. Veldheer had a tough start to the season, allowing the fourth-most pressures (27) by an offensive tackle through Week 5. By contrast, he allowed just 12 total pressures in the eight games since, ranking fifth at his position with a pass blocking efficiency score of 96.8 in Weeks 6-14. According to head coach Bruce Arians, the “plan right now” is for fifth-round rookie Will Holden to replace Veldheer at left tackle. Holden has received limited playing time so far, seeing just 106 snaps through 14 weeks, almost all of which have come at left guard. Holden allowed 26 total pressures in his 13 games last season as the starting left tackle for the Vanderbilt Commodores. His pass blocking efficiency score of 95.2 ranked 65th out of 78 draft-eligible offensive tackles. However, he impressed in the running game, achieving a run blocking grade of 79.6, which ranked eighth in his class.